Custom-Printed Notepads are one of the best ways to keep your company’s name in front of current and prospective customers. Like a miniature billboard, a custom notepad will repeatedly display your marketing message, helping to keep your business top-of-mind for weeks, months or longer. Not only are custom note pads very economical to produce, they can be printed with virtually any promotional message you wish to convey – company name, logo, slogan, contact information, photos and so on. Adding a full-color logo, photos or artwork helps create a quality impression. In addition, note pads are quite durable and very easy to distribute, making them well-suited for trade show giveaways or for sales reps to hand out to current and prospective customers. The most common notepad sizes include 8.5" x 11", 5.5" x 8.5" and 4.25" x 5.5" with 25, 50, or 100 sheets per pad. However, Formax can create custom-printed pads in any dimensions or sheet count you prefer. Notepads Provide Ongoing Exposure. Most recipients of note pads will keep them handy and use them almost daily. This means your organization’s name and contact information will always be prominently displayed. No other type of marketing offers such repeat exposure for so little investment. Notepads Encourage Reciprocity. People love to receive gifts and freebies. Even though they are distributed with no obligation, giving a gift to a current or prospective client builds goodwill and leaves a favorable impression…which increases the probability they will like you, remember you, and do business with you. Notepads are Practical and Useful. In addition to being effective tools for promotion and brand awareness, imprinted notepads serve a very practical and useful purpose for the recipient. Just about everybody appreciates a handy pad of paper, for use at home or at the office. Notepads are Very Affordable. 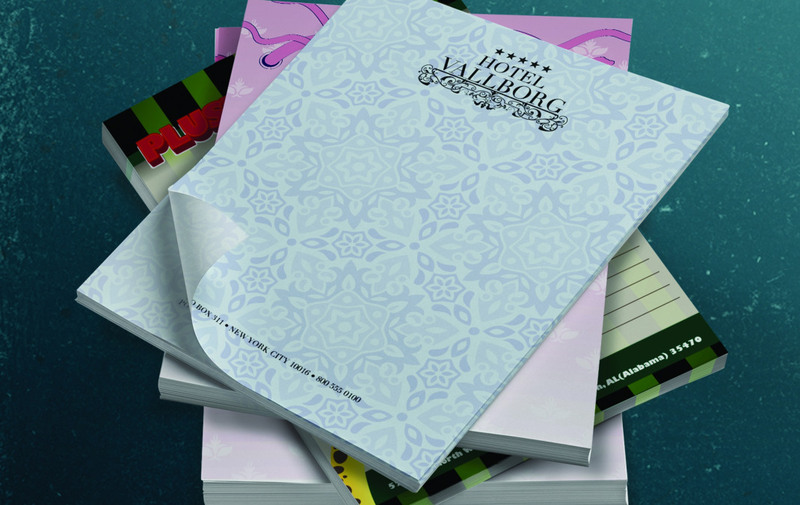 Custom-printed notepads have a high perceived value yet are extremely affordable. In fact, notepads are one of the most affordable promotional items one can buy. Notepads are Totally Customizable. Notepads can be printed with any message, image or layout you choose. You can have them printed in full-color, one or two colors, or plain black ink. They can also be made as lined or unlined pads. With note pads, there is a lot of room for creativity so the design is totally up to you.